Quickly jotting some notes down here, this will likely be edited when I have a chance to cross reference calendars of availability and when I hear or learn about more things to add. It's entirely possible that even though I list things here, I might not be able to attend, but at the same time I'll usually try to. Some events I have no current plans to attend, but may change depending on group interest (like ZombieCon). Takes over downtown Atlanta, GA, quite literally filling up all 5 host hotels and over 22 satellite hotels. Basically, the Hyatt, Marriott, Hilton, Westin, and Sheraton, plus anything else in a 15-mile radius. https://kk4dsd.com/2012/09/07/the-zombie-squad/ -- this was me wandering around Dragon Con 2012, dressed as "The Radio Guy Surviving the Zombie Apocalypse". I had always wondered just who had taken those pictures, now I know. 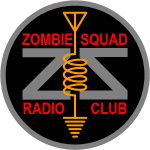 http://www.arrl.org/news/the-amateur-am ... he-zombies -- This is posted on the American Radio Relay League's official news site, from 2008, where the writer was at an event also tabled by ZSC-001's group in Missouri. The one event I know I'll be attending is dragoncon this year. Anything else I'm not going to take work off so it would be if as my schedule comes each month if I get it off or not. ---> The good thing about these meetings is you don't even have to leave your house to attend. Speaking of virtual, online, and radio-based meetings, we have set up a Skype meeting before. Skype, TeamSpeak, Ventrillo, or any of their modern equivalents could possibly be an option for dates and times when most of us are too busy to meet in person. I could probably have a dedicated host server for one of these if that's what we decide to do.